This year’s Art & Philosophy graduates have presented an exciting host of work, covering a diverse range of subjects and mediums. Art & Philosophy work can be found at various locations throughout the show. Positioned outside at the back of the Crawford building, Ahmad Deeni’s work considers the politics of space by creating a literal space outside of the art school. 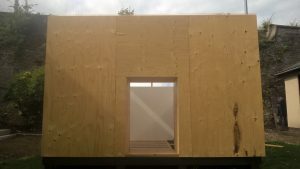 In inviting audiences to interact as part of the process, he attempts to encourage conversation about marginalisation and privilege while manufacturing a public space for all. His shed-like structure is both inviting and provoking, while proving the artist’s ability to be an expert architect of both structures and concepts. Saoirse Anis’ work is a multiplicity of found objects and materials which create an exciting environment, in which both viewer and artist are invited to rethink their relationship with artworks. The arrangement of materials encourages interaction which she embraces in photographs of performances accompanying her installation. Whilst citing “chance as a co-creator”, her installation is an unpredictable universe, crafted both carefully and chaotically all at once. 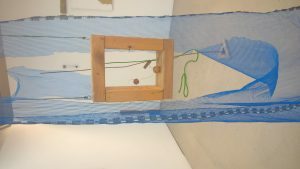 Her work can be found on Level 2 of the Crawford building, which is also host to Isla Dodds’ promising installation space. ADuLt explores the way in which fine art and philosophy can intersect to explore consumerism. While addressing problems of accessibility in art, she creates an imaginative brand which becomes a platform for affordable art within the institution. By using her brand as a medium and creating a slick urban display behind her products, she pushes the confines of fine art while presenting a line of clothing and accessories worth queuing for. Caitie O’Hara’s sculptural installation on Level 5 of the Crawford building delves into the cultural implications of language and heritage. Her grand structures immerse the viewer within a physical and conceptual landscape referencing politics and binaries in language in the context of Northern Ireland. Viewers navigate through elegant spear-like poles which are simultaneously beautiful and rouse the feeling of being on a knife edge. Level 6 of the Crawford building is home to Catriona Beckett’s immersive, and similarly uneasy, installation space which harnesses a crossroads between sound and image to construct a universe which echoes familiarities and seeks new meanings. In striving towards a “new ever-shifting aesthetic”, Beckett skilfully creates a surround sound and visual which succeeds in bringing the ordinary into the surreal. On Level 5 of the Matthew building, Sinéad Creaney blurs the boundary between artwork and playground. 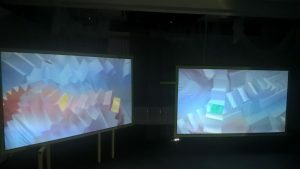 Audiences are invited to play within her installation which includes a giant game-board style piece. Creaney’s inventive exploration of physicality and tactility allows audiences to both view and become part of the artwork. 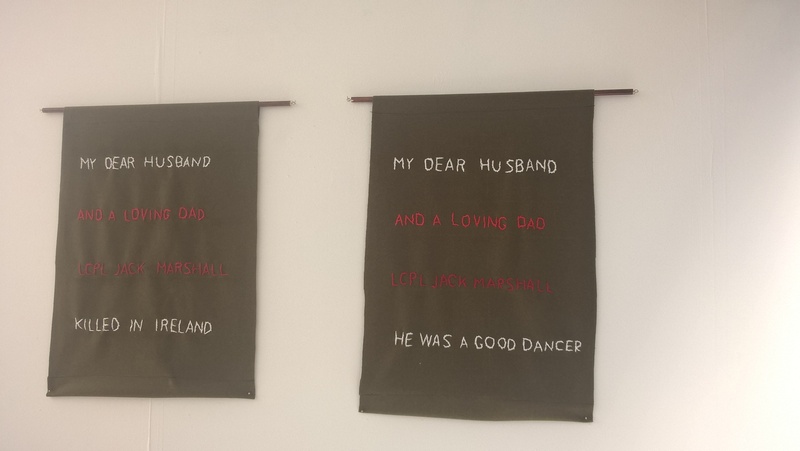 On the same floor, Keira Marshall weaves an intimate relationship with her late Grandfather using archival source materials. 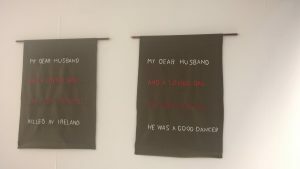 She creates intricate uniforms which reference the life of her Grandfather and the conflict in Northern Ireland in the 70s, offering both a historical and personal perspective. Her space is a refreshingly soulful moment within the degree show, and her uniforms show an ability to bind politics and textiles exquisitely. All of the Art and Philosophy graduates have succeeded in displaying some fascinating work. When studio practice is informed by philosophical practice, the result is some of the most compelling work of the 2018 DJCAD degree show.